I responded on a personal level to today’s featured picture book, Cinnamon Baby (Kids Can Press, February 2011) by Nicola Winstanley and illustrated by Janice Nadeau. (Wow. Check out that website for lots more art.) From a professional standpoint—as a children’s librarian, who studied children’s lit in grad school and who is always trying to separate the good children’s books from the not-so-good ones—I love it, too. It resonated with me on both of those levels, that is. It’s the story of a baker named Miriam, who owns her own little bakery. She makes bread and makes it well: “She made a spicy bread, studded with little peppercorns and basil, and a sweet bread with ginger. She made a light, white loaf with dill, and a crusty brown one with sunflower seeds and honey.” (Mmm. See? The story had me right at the beginning.) The cinnamon bread, her favorite, she always saves for last. While baking, Miriam sings the songs her mother taught her as a child. It’s her beautiful voice and the aromas from her delicious bread that attract Sebastian one day, riding around on his bike, who asks Miriam to marry him. Time passes. 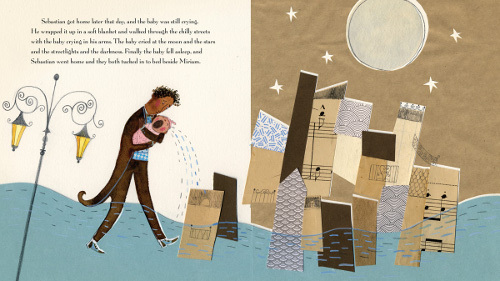 A baby is born to Miriam and Sebastian. “The child had big brown eyes and dusky skin and smelled like sweet milk.” All is well. For a while. On the fourth day, the baby starts crying and simply won’t stop. No matter what Miriam does, the baby is a scream machine, though breaks for sleeping are occasionally taken. “The baby is not sick,” the doctor tells Miriam. “I think it is simply unhappy.” But everyone is confused as to why. One day, her sleeping baby reminds Miriam of a “little, wrinkled raisin,” and she’s struck with a good idea: Heading to the bakery in the “still-dark morning,” Miriam gets right to work, stirring, pouring, measuring, baking. The baby’s cries subside. Miriam makes just about every kind of bread she knows to make, yet it’s when the baby smells the cinnamon bread that it stops crying altogether. Everyone lives happily ever after. The end. Now. My oldest is named Miriam, though she decided to go by her middle name when she was three, and it’s a name I don’t hear often in the South. So, that right there was my first personal connection to the book. But also: She was the world’s. screamiest. baby. I could go on (and on) about this and its great challenges, and I won’t. This isn’t a parenting blog. It’s enough to say that she wasn’t ill, and she wasn’t even colicky. This kind of constant unhappiness (whose only remedy was for mama to hold her, which meant I constantly had a baby in my arms and slept with said baby, though I hadn’t planned to) is a level of confusion and mystery way beyond simple colick (which is itself not simple to begin with). It’s very difficult to describe this kind of almost-incessant screaming (though Dr. William Sears has a name for it and a whole book about it, and just him NAMING IT was so helpful that I decided years ago that if I ever meet that man I’m gonna hug his neck). So, boy howdy and howdy boy, did this tale resonate with me on those personal levels. 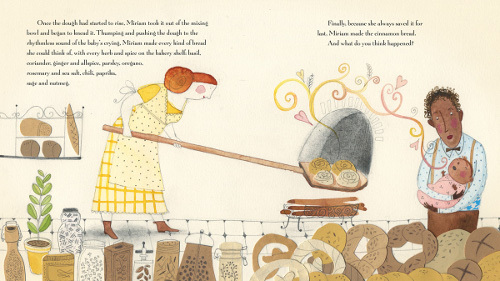 Also—and I suppose it could be argued I’m reading too much into it—I feel like Miriam’s story (the picture-book Miriam, that is) is more than just about the smell of bread making a baby’s cries subside. Having a baby is a huge—though happy—shock. The boot camp that is early parenthood is a ginormous life-changer, no matter how prepared you convince yourself you are. The mother, in particular, has to give herself up on multiple levels to this new human. It’s an adjustment. In my experience, going from full-time library’ing (and doing half a billion other things) to full-time parenthood was challenging (and was actually one reason I started blogging — that is, to engage in conversations again about children’s lit, while at home with a human being incapable of abstract thought). To me, what I found moving about this picture book was the notion that Miriam returned to the pre-baby love of her life: Her work. Her baking. Something at which she excelled. Something for which she felt passion. Maybe that joy is what made screamy baby unscreamy. Publishers Weekly wrote, “Debut author Winstanley’s simply-told fable offers a gentle message about the importance of nurturing the soul.” Yeah. True. But I’m talking about mama’s soul here, too — not just baby’s. I dunno. Food-for-thought anyway. Anywhoozles. Lovely book. I like it. Winstanley’s writing is a feast for your senses. Janice Nadeau, a Canadian illustrator and three-time recipient of the Governor General’s Award for Illustration, rendered the tale in watercolor, graphite pencil, and paper collage — all assembled digitally. Her palette is primarily composed of warm earth tones, and there are endearing, funny details for observant readers. (For one, Miriam’s hair looks a bit like a cinnamon bun.) 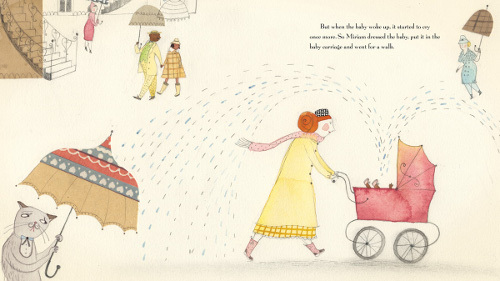 Her textured, fine-lined illustrations on cream-colored paper have a real delicacy and charm. And bonus: I just found this March New York Times feature on the book. CINNAMON BABY. Text copyright © 2011 by Nicola Winstanley. Illustrations copyright © 2011 by Janice Nadeau. Reproduced by permission of the publisher, Kids Can Press, Tonawanda, NY. Ah. Grunged up with living. So true. 2). You know when you’re having a bad day or sad day or, whatever, just a murky, not-sunny day? I was reminded this week, by hitting “shuffle” on my iPod, that songs with hand claps can help those moods. I need to make a Songs With Hand Claps mix. I really do. This song below, “Heart to Tell” by The Love Language, is one. No, really. Consider listening to it, pretty please. It’s short, and it’s a perfect little pop song. That percussion’y-hand-clappy part there that you hear about thirty seconds in and then you hear one more time later? THAT JUST MAKES MY BRAIN HAPPY. P.S. Should I email my suggestions to Paste Magazine? P.S. Again: The Love Language’s CD is totally named “Libraries.” Score. 3). Okay. I want to word this carefully. I don’t want to sound boastful, and well…one can sound A Bit Much, I’m afraid, when going on and on about her blog. Know what I mean? At least I try not to take it all too seriously, as I’m just a tiny speck of dust in cyberspace. Anyway. More than one person told me this week that they appreciate how 7-Imp connects them with others. Illustrators with other illustrators. Authors with illustrators. Authors with authors. And, best of all, readers with books (or authors or illustrators). And, you see, this makes me so happy. I hope I don’t sound braggy? That is the highest compliment you can give 7-Imp, though, in my book. The very highest. I like connecting people. Why else blog? 4). 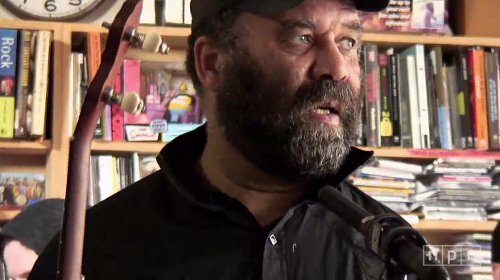 All I can say about this Tiny Desk Concert with Otis Taylor is YES. Just YES. And also: Why can’t these musicians with banjos have concerts at my tiny desk? 6). Are you tired of me talking about Elbow? BUT THEY’RE BRILLIANT, I TELL YOU. “Tables are for pounding here / …And we’ve love enough to light the street / Everybody’s here.” If there’s an afterlife, I hope it’s like what’s depicted in that song. 7). A chunk of really good, super fresh bread (a sourdough or Italian loaf is best) with a piece of really rich cheese (say, some good Colby) and a glass of water when you’re super big-time hungry. Throw in a few grapes. Simple foods are best. Picnic foods. Yeah, that. Picnic foods are best. BONUS #1: We have a teeeny-tiny extension on our final manuscript deadline for our book, meaning it will now hit shelves in Spring 2013 and not Fall 2012. Which is fine. A bit more time is good, too, though I’ll be happy when the final manuscript is turned in. You’ll hear me whoopin’ and hollerin’ this summer when we do that. I bet Cris in Italy will be able to hear me. It’ll be that loud of a whoop. ‘Cause, you see, during that (probably short) span of time between turning it in and getting edited and starting to revise, etc., I’ll have time to read a bunch of novels. I’m gonna lock myself up in the house and do so, I think. BONUS #2: Acts of kindness go a long way. BONUS #3: Speaking of separating the good children’s books from the not-so-good ones (as I did at the beginning of this post), here’s a wonderful way to start from author/scholar/professor/blogger Philip Nel. THE KICK YOU CAN ASSUME EXISTS EVERY WEEK: My children are healthy and happy. Living 6 hours ahead of you, this post hit my Google inbox just as breakfast was frying. What a great accompaniment to my eggs n bacon…especially Miriam’s bakery, I could so imagine Miriam running my little boulangerie round the corner! I could smell the cinnamon way across the ocean. Thanks for an uplifting post, as always. Thanks, Joanna. I could use some cinnamon bread right about now. I have Cinnamon Baby in my office to read to students. Can’t wait. Jules and all, I missed you these past two weeks!Glad to be home. I am curious how you chose the name Miriam, Jules. It’s a sweet name. We missed you, too, Jone. I wish I could watch you teach poetry. MATT! You all will have so much fun with him there, I’m sure. Was your vacation great? Please have a cinnamon roll for us all this morning at the Bakery. Great post, great kicks today! 1. I turned in my big Master’s Paper that’s kind of the culmination of everything, and my advisor had the highest praise for it. 2. The former executive director of my workplace is now a vice chancellor at a local public boarding school (yes!) and suggested that I apply for their head librarian position, which I now have – and she’s hiring supervisor. 3. The weather here has been gorgeous a lot recently. 4. I’ve been reading Goddess Guidebook and Leonie’s positive attitude, grace, and gratefulness are contagious. 5. My sister has worked it out so that she can come home from the job that was 2 hours away and making her live apart from her husband – which means that, even though the way she arranged this was to pick up 2 part-time jobs that are going to make her quite busy, I might get to see her more! 6. I decided to have fun when I’m singing, instead of treating it like a job, and it has made me so much better. Which I think pleased my voice teacher. 7. Now that I’m done with all of the reading for my Popular Materials class, I can read whatever I want. YA novels here I come! thanks ever so for your #3 which I whole heatedly agree with! We are home from church today, even though it’s Palm Sunday– the girl has been sick ALL WEEK, and when Ms. WakeUpWakeUpNow says that she just wants to rest in her bed, we take note. My husband brought her breakfast in bed and she’s listening to Elizabeth Mitchell now. Does she realize how good she has it? Does she? And now I’m torn between wanting another cinnamon-raisin bagel and a big ol’ plate of picnic food. 1. We had a lightning strike a couple weeks ago which killed The Missus’s PC (and some other things but not, thank gods, my own computer). She decided she wanted to replace it with a laptop, so we went through the whole Dell configurator process and they told her it would arrive this Tuesday (day after tomorrow). FedEx actually delivered it yesterday afternoon, while she was at the store, so I sort of tucked the box on the floor, to the right of the sideboard in the foyer. When she got home I said I had to show her something. “Come over here to the window.” I could feel her tension mounting, because she (as she will admit) tends to imagine disasters at every turn, and was not looking forward to this whatever-it-was. “Now,” I said, “look down. Down. And to the left. Left. Inside the window.” I felt her reaction before I saw it, and then she turned and she had these little sparklies in her eyes. Classic moment. 4. We sometimes watch these timed-cooking competitions on FoodTV. Every single contest comes down to a last-split-second burst of activity by one or more chefs, which makes us suspicious that they’re editing to make these things more suspenseful than they really were. Anyhow, in the real world, I love insanely busy weeks of work-and-writing-and-blogging which wrap up exactly at 5pm on Friday, with nothing left hanging. I wouldn’t want every week to be like it, but it’s fun and satisfying when it happens. 5. The city here put out a news release this week about a “Rock of Ages” concert they’re sponsoring. “An hour of upbeat and entertaining musical hits by the Beatles, Queen, Bon Jovi, Rod Stewart, James Brown, Bill Haley and the Comets and many more.” The kicker: they’re holding it at the Senior Center, performed by old folks from an area assisted-living facility. That lemonade juicer’s getting a real workout this week: I’ve decided to be happy to have heard that music from the original artists, rather than grumbling in a (declamatory) I-hate-getting-old way. Jules: The Girl Who… has a kickin’ title and a kickin’ cover, but the thing that leaves the biggest impression on me is your review here — If you’re calling it fabulous and saying it makes your day, it’s got to be awesome. Yay for connectivity, a bigger yay for health and kindness, and good luck with the deadline! Jone: Welcome back! Hope you enjoyed the vacation. You’ll have to tell us all about Matt Holm’s visit – the Babymouse series is adorable! Steven: I love Ancient Egypt. Kiba: It’s odd for me to type Kimberly when addressing you. 🙂 Welcome back. I’m glad that you had such a wonderful week, filled with so many accomplishments. You rocked that paper, and I’m so glad that you are feeling good about that, AND work, AND singing. Yay! Yay also for your sister, and for your job application. JES: Sending you healthy thoughts. Thumbs-up for sparkles. 1. People all over the world donating YA books for Rock the Drop – Did you participate? Check out the pictures, videos, and posts at the readergirlz blog! Oh, I love cinnamon too, and baking, and this book looks so very lovely. Jules – I am going to email you, I have something with cinnamon that I think I need to mail your way. Love the name Miriam, I really love the older names you don’t hear as often. A friend’s daughters are Eleanor and Beatrice, and I just met an Adeline the other day. Love your kicks this week too, especially number 1 – the title alone has me hooked, plus your kids being healthy. And I am with you on acts of kindness going a long way. 1) A Sip & See for a friend’s second baby. I had never been to one, but love it. It’s a brunch with mimosas and other goodies where you Sip your drinks, and See the new baby. 2) A get-together with my co-ed soccer team at the pub that sponsors us. Lots of fun meeting players’ partners/wives/bf’s etc…and just hanging out. Really great group of people. 3) A morning run in sunshine today. We’ve had endless rain, so this is a super-huge kick! 4) Scored some Portland Timbers tickets for a game in May! 7) The rain has been seemingly endless this winter and Thursday and Friday it was coming down in sheets all day. So the sun shining today has me grinning from ear to ear – it’s fabulous! Oh, and my super-duper-fantabulously unexpected kick: my 15 year old goddaughter, who now lives far away on the East Coast, loves to read. And she sent me an email this week thanking me for sending her The Disreputable History of Frankie Landau-Banks. Went on about how much she loved it, how it made her think, and how it’s now one of her favorite books. Woo-hoo! Made my week! Off to breakfast now, but will come back and read everyone’s kicks in more detail and check out links later today. Have a great happy sunshine-filled week everyone! Steven, love that poem, love the very phrase “Undog Places.” And, my, you’ve done some good readin’. Kimberly, good luck with the job, and have fun reading whatever the hell you want. Good feeling, that. Amy, I’m thinking you’ve seen some cherry blossoms? (I’m a total nerd for saying that.) We lived briefly in D.C. once, and I know what you speak of. Thanks for the 7-Imp compliment, too. Farida, true that. About Narnia. I hope your daughter feels better soon. Man, whatever she has is just stubborn, isn’t it? John, nope, the illustrations in the book aren’t INTEGRAL, though I do love me some Ana-Juan artwork somethin’ fierce (what initially drew me to this book). …Kick #2 is making me hoot aloud, though I do hope you feel better soon. And I LOVE KICK #5. (My grandmother was in a kazoo band that toured other senior centers.) And I am stunned, John, that you have no links today. That is, indeed, a record. Little Willow, let me know what you think of the book if and when you read it. … Congrats on Rock the Drop, LW. Did I participate in any way? Nope. I am pathetically busy, trying to meet my final manuscript deadline. I’ll have to help spread the word about the next one. Rachel, you made me think of this book with your first paragraph. Both my daughters’ names are in there, including “Piper” (which is odd, as it’s hardly old-fashioned). I like Adeline, too. My youngest is Ada (a form of Adeline, I think), though everyone always thinks I’m saying the ever-present “Ava.” …. Never heard of a Sip & See either. Who knew? But, hey, I’ll go to anything involving mimosas “and other goodies.” Glad you’re getting some sunshine, and that is pretty great about your goddaughter. I LOVE THAT BOOK. Thanks again for the email. Jone – glad you are back from vacation, hope it was wonderful! Hooray for tulips and Grand Central Bakery. Steven – love your five year old’s turn of phrase, and the poem it inspired. Makes me wonder if the undog places of the house are where the ghosts hang out. Kimberly – congrats on turning in your Master’s Paper! Amy – cherry blossoms are so very lovely. Farida – hope your little one gets better soon. And after all those stairs you climbed, I’ll bet your calves are unbelievably strong and can carry you anywhere. JES – love your kick number 1, especially the way you describe it happening. LW – go you for Rock the Drop! And glad to know you are taking time to breathe. Jules – I’ll get that little surprise in the mail this week. And that book looks awesome! I may have to get it for some friends who are expecting. And I love Disreputable History as well. I am always happy when the kids I love get into reading. Have to tell you, that Elbow song. Whew. I had it on in the background while looking at a photo album of Cheyenne. Oh my. Emotionally loaded but beautiful, the combination had me in tears. Have a lovely, cinnamon filled week! So glad you like the Elbow song, Rachel, and the book. I think it would be a good gift for expectant mothers, come to think of it. I’m also glad the post inspired cinnamon in your day. Cinnamon makes most things better, don’t you think? This is a BEAUTIFUL book – lots of expectant mamas in my life right now, and I can’t wait to start gifting it! Emily, I love being a Suzy Lee evangelist! She’s one of the best. Thanks for sharing the story. Thank you so much for your beautiful review of my book, and all the lovely comments that follow. I wanted especially to thank you because you totally GOT IT! Yes, it’s really about the mother’s soul . . . I too had a screaming baby, and no sleep for TWO years. I discovered I had to nurture myself, otherwise I had nothing left for my beautiful little girl. I’m so fortunate to have had Janice as my illustrator. What a gorgeous feast she makes the book! I am so thrilled to be introduced to your blog; I look forward to following it. Hi, Nicola! What a pleasure to hear from you. Yes, those of us with the non-stop screaming babies could start a club, huh? Immediate entry when a mother with That Crazed Look in her eye is spotted by one of us! I really do enjoy the book, and—as so many have pointed out here (and which I hadn’t thought of myself)—it’s a great gift for new mamas. 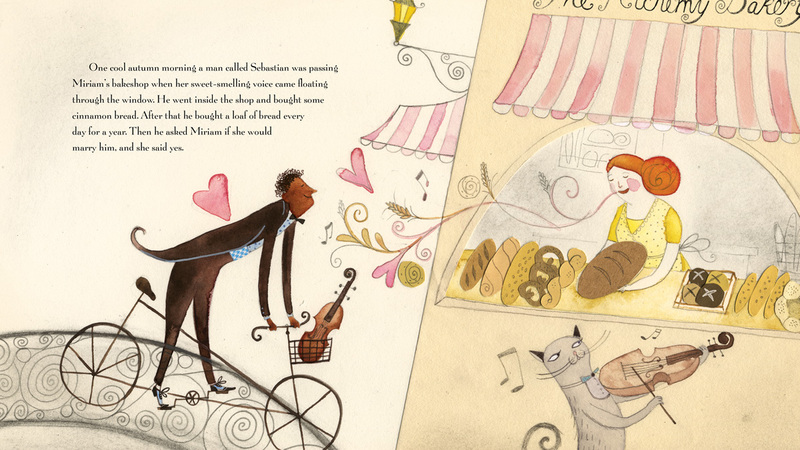 I can almost smell the cinnamon in this yummy, warm, and beautifully illustrated story. Thanks again for keeping me aware of the new wonders out there! Cool. I wrote a tweet about this post. Good work. Outstanding post, I believe blog owners should acquire a lot from this weblog its really user pleasant. So much fantastic information on here :D.